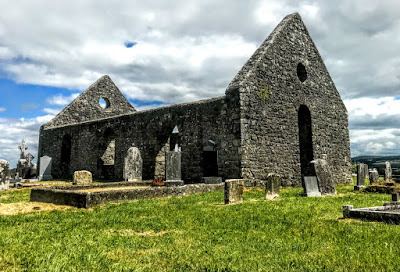 While I was looking for Kilmore House, a former Comerford family home, between Nenagh and Silvermines, Co Tipperary, yesterday afternoon [13 July 2018], I also visited the nearby ruins of Kilmore Monastery, with its ruined Church of Ireland parish church and its interesting graveyard. The original monastery at Kilmore is said to have been founded by Saint Odran, who came from a wealthy Midlands family. By tradition, Odran or Oran (Latin Otteranus), sometimes Otteran, was a descendant of Conall Gulbán. 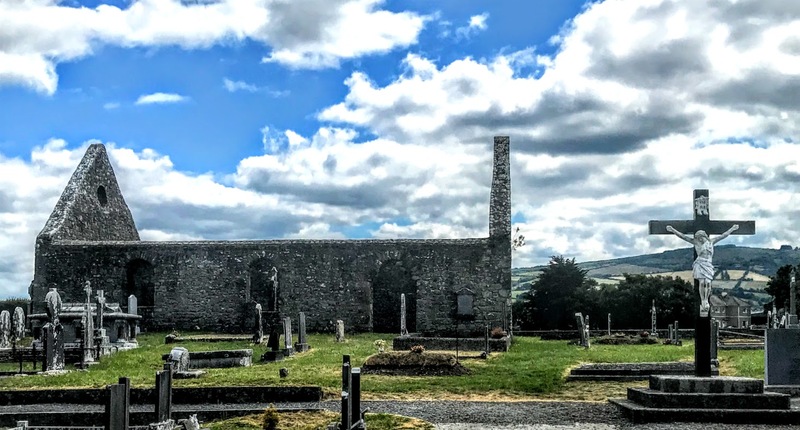 For over 40 years, he lived in the area now known as Silvermines, and built a church there in 520. According to tradition, Odran also served as Abbot of Meath, and founded Lattreagh. When he was an elderly monk around 530 AD, he was one of the 12 monks who accompanied Saint Columba into exile on Iona, off the west coast of Scotland. Saint Odran died on Iona and is buried there. He was the first Christian to be buried on Iona. His feast day is 27 October. One legend says Saint Columba saw devils and angels fight over Saint Odran’s soul before it ascended to heaven. Another legend says Saint Odran consented to being buried alive beneath a chapel that Saint Columba was trying to build at Iona. A voice had told Saint Columba that the walls of the chapel would not stand until a living man was buried below the foundations. Each morning, the builders arrived at the site to find all their work of the previous day undone. So, Saint Odran was consigned to the earth, and the chapel was built above him. One day, however, the story goes, Odran lifted his head out of the ground and said: ‘There is no Hell as you suppose, nor Heaven that people talk about.’ Alarmed by this, Columba quickly had the body removed and reburied in consecrated ground – or, in other versions of the story, simply called for more earth to cover the body. In a Hebridean version of this tale, Odran was promised that his soul would be safe in heaven. Some time after the burial, Columba wanted to see Odran once more and opened the pit under the chapel. When Odran saw the world, he tried to climb out of his grave, but Columba had the pit covered with earth quickly to save Odran’s soul from the world and its sin. The oldest remaining church on Iona is dedicated to Saint Odran. The surrounding cemetery is called Reilig Odhráin in his memory. These legends are among some of the few examples of foundation sacrifice in these islands, although the story of Saint Odran’s self-sacrifice does not appear in Adomnán’s Life of Columcille. George Henderson says that the legend points to an ancient folk-belief similar to stories found in the Arthurian legends. Saint Odran was chosen by the Vikings as patron of the city of Waterford in 1096 and later chosen as patron of the diocese. Meanwhile, the original monastery at Kilmore, which was a wooden structure, was replaced by a stone building around the year 1000. In a raid against the Anglo-Normans, Toirdelbach O’Brien burned down the monastery In 1285. The monastery was rebuilt and survived until the Reformation, when it was suppressed. 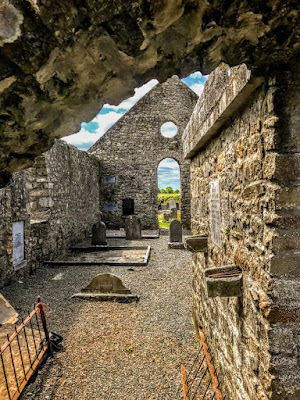 The church on the monastic site continued to serve as the Church of Ireland parish church until a new church was built at Silvermines (1809-1820). 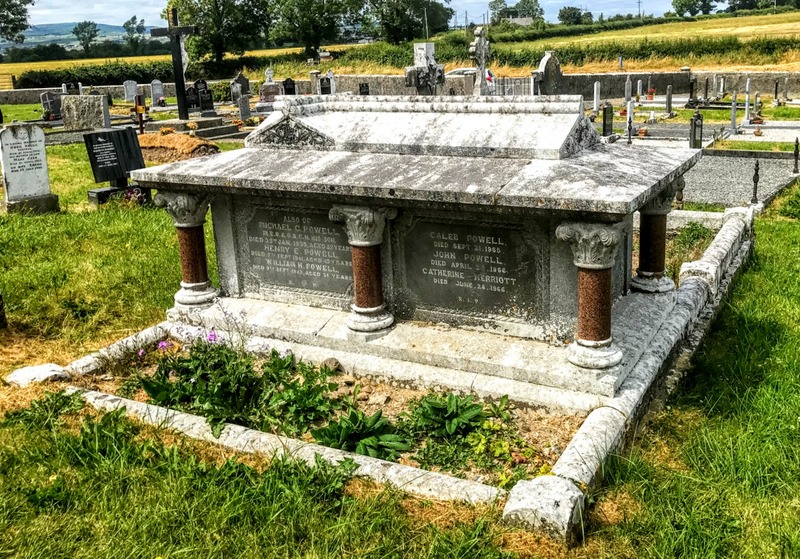 Samuel Lewis notes that the Rectory of Kilmore was held by the Precentor of Killaloe Cathedral, and that the Vicar of Kilmore was the Very Revd Gilbert Holmes (1772-1846), who was also Dean of Ardfert (1802-1842). He lived at Saint David’s, Nenagh, and died at Kilmore on 23 December 1846. The church ruins and former churchyard have interesting monuments and graves associated with the Prittie, Carrol, Powell and other prominent local families. 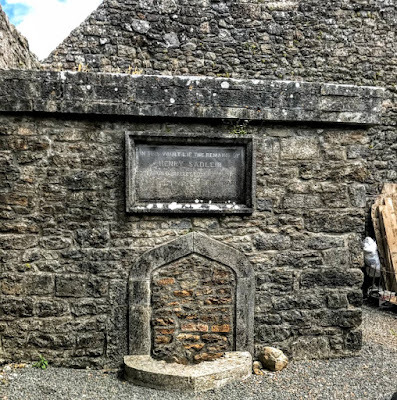 Inside the ruined church, a plaque marks the vault of the Prittie family of Kilboy House, an influential political family with the title of Baron Dunalley, of Kilboy, Co Tipperary. The family house was Kilboy House, near Nenagh, which was built in 1771 to the design of the architect William Leeson. It was three storeys over basement, with a five-bay entrance front with a central pediment and four large, engaged Doric columns. The top storey was treated as an attic above the cornice, and there was a five-bay side elevation. The title of Lord Dunalley was given to Henry Prittie (1743-1801) in 1800. He had been MP in the Irish House of Commons for Banagher (1767-1768), Gowran (1769-1776) and Co Tipperary (1776-1790), and the peerage was a reward for his son’s support for the Act of Union. His son, Henry Sadleir Prittie (1775-1854), the 2nd Baron Dunalley, was MP for Carlow (1798-1801) in the Irish Commons and for Okehampton (1819-1824) in the British Commons and an Irish Representative Peer in the House of Lords (1828-1854). Henry O’Callaghan Prittie (1851-1927), the 4th Baron Dunalley, was the last Lord-Lieutenant of Co Tipperary (1905-1922). Kilboy House was burned down by the IRA on 8 August 1922. The house was rebuilt without the top storey, but the house was demolished around 1955, and a single-storey house in the Georgian style was built over the original basement. The house was bought in the 1980s by Tony Ryan, founder of Ryanair and Guinness Peat Aviation. More recently, the Ryan family was granted permission to build a new Kilboy House. The Dunalley title is now held by Henry Francis Cornelius Prittie, the 7th Baron Dunalley, who succeeded his father in 1992 and who lives in Oxfordshire. 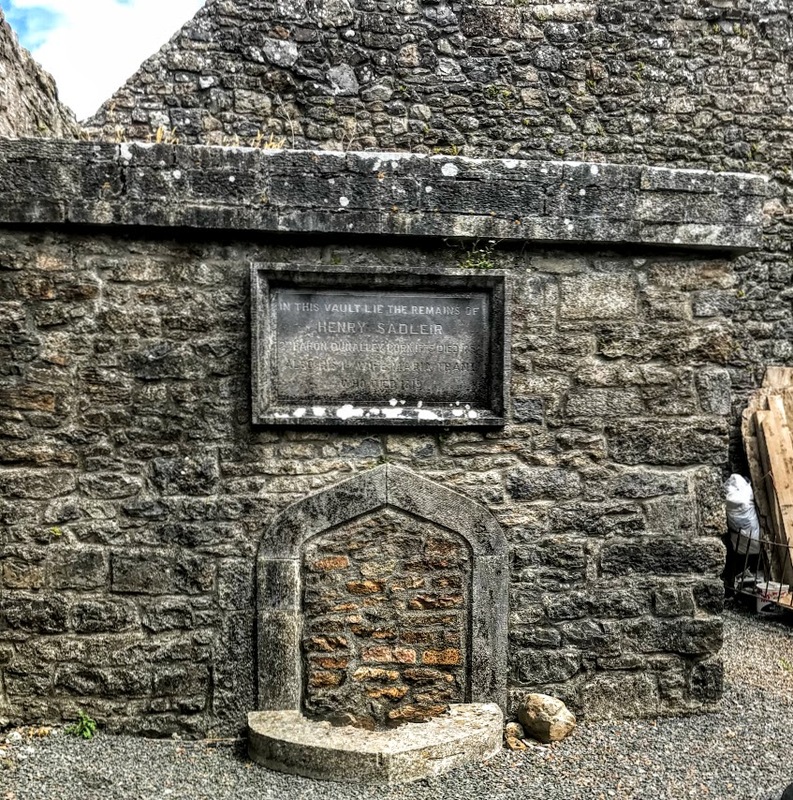 The churchyard also holds graves associated with the Carrol family, who had their home at Tulla House in the 19th century. William Carrol lived there in 1814, Major General Sir William Parker Carrol in 1837, Captain WH Carrol in the 1850s, and the Carroll family was still living there in 1906. Major General Sir William Parker Carrol, who was born at Tulla House in 1776, fought in many of the military campaigns during the Napoleonic wars. His son, Captain William Hutchinson Carrol of Tulla House, Nenagh, owned an estate in Kilmore, and bought part of the Lissenhall estate of the Otway family in 1853. In the 1870s, William Hutchinson Carroll owned 1,856 acres in Co Tipperary. Memorabilia, photographs and other items from this family form part of the Carrol exhibition at Limerick Civic Trust.